Would a decision invalidating the Affordable Care Act, in part or in whole, damage the Court's legitimacy? As I wrote on Friday, I'm among those who thinks the answer is "yes," although I was thinking primarily in the moral, substantive sense of the word. In other words, such a poorly reasoned, narrowly won decision should erode the Court's authority. As the Justices have said repeatedly, the courts should overrule the work of Congress only on the rarest occasions. “Conclusory second-guessing of difficult legislative decisions,” Chief Justice William Rehnquist once observed, “is not an attractive way for federal courts to engage in judicial review.” In recent years, the Justices have intervened in these matters solely to protect the rights of minorities shut out of the legislative process. But whether the public will see things the same way, now or in the future, is a lot more difficult to say. Who, after all, is going to lead the charge against the Court? Liberal journalists like Linda Greenhouse and Dahlia Lithwick, whose human capital is invested in covering the Court? The fraternity of elite liberal lawyers who served as Supreme Court clerks, for whom undermining the Court’s legitimacy means undermining the value of their own prized credential? Liberal constitutional law professors, who are as invested as anyone in the Court’s significance? ... At most, a ruling against the ACA will have the same effect as Bush v. Gore or Citizens United, or Roe v. Wade and Boumediene for that matter; a fair amount of caterwauling, with the Court as an institution remaining unscathed. Bush v. Gore, a decision just as nakedly partisan and even less legally defensible than a decision striking down the ACA would be, did not undermine popular support for the Court or lead to a rash of executive officials refusing to obey its orders (Democrats liked the Court less ... but Republicans thought better of it). Nor would striking down the ACA be the first politically controversial decision the Supreme Court has issued. Some landmark liberal rulings have created a semi-permanent Republican apoplexy about liberal "judicial activism" that becomes more remarkable as we go past four decades without a consistently liberal median vote on the Court. And yet, this selective outrage has comfortably coexisted with a willingness to both use the courts for conservative ends and ongoing public support for the Court. 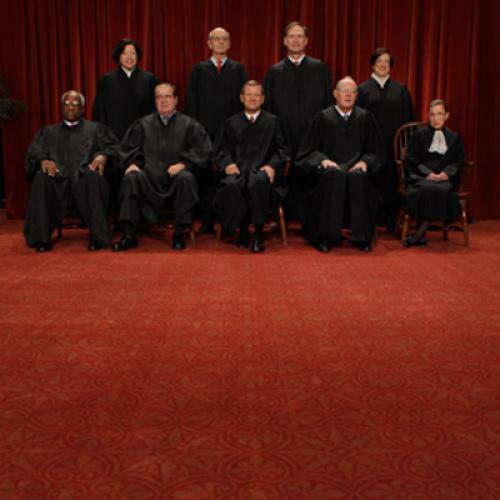 A decision invalidating the mandate would paint Obama into a corner, forcing him to make the Supreme Court a big issue in his reelection campaign. Bush v. Gore didn’t make the Court look good, but it didn’t lead to millions of dollars worth of television ads trying to persuade the American public that the Republicans on the Court are a bunch of despicable political hacks. Look what millions of dollars in negative ads have done to Mitt Romney’s poll numbers. Does the Court really want to subject itself to that? Bernstein, Lemieux, and others who agree with them may be right. As always, I'm more comfortable saying what should happen than what will happen. But keep in mind that the effect of narrow, seemingly partisan decisions can be cumulative. A decision striking down the health care law might seem more alarming precisely because it's part of a pattern that started with Bush v. Gore and Citizens United. The liberal base will certainly see it that way. And although the mandate itself has always been (highly) unpopular, the benefits of insurance reform—in particular, the availability of insurance to people with pre-existing conditions—has always been (highly) popular. If the Court throws out those provisions, or causes them to fail, the public might take more notice, particularly if Democrats frame the issue that way. This brings me to my last point. Public perceptions of this case, and the Supreme Court, are not some static reality. How people react to the final ruling will depend a great deal on what they hear and read, directly and indirectly. And that's true no matter what the Court decides. Update: If you haven't already, read Kevin Drum's take on these same questions. Also, I changed "thinly reasoned" to "poorly reasoned" in the first paragraph. I think the justifications for overturning the mandate are weak—unless, again, the Court is willing to admit it's seriously rethinking important precedents. But the justifications exist.